This is Newman Noggs, the original Newman Noggs: the first of the Dickens Dogs. Were the age of miracles not passed, he would soon be celebrating his thirty-fourth birthday and, for everyone who knew him, joy would be unconfined as they remembered his long and extraordinary life and what he meant to them. For Newman – this Newman – was a force of nature, and of immortal memory. To this day, in his section of the family hope-chest, are to be found wonderful reminders of what he meant to so many people: the birthday cards, gift-tags, notes and letters written after his death, commemorating the biggest, softest, greatest Noggs of all. In this photograph, taken when Newman was only two and in his youthful prime, there was a game afoot between him and his best friend, a young Boxer called Misty, but he had stopped still long enough for her owner to record what a magnificent creature he was. In those days he was yet to be joined by Uncle Willie (of whom you can read more in the Old Guard section of the blog), and he was living in the dog-centred heaven which is Epping Forest. Every day he enjoyed three walks around and about the many and various wooded routes which spiralled from his house – routes he knew like the back of his paw. More times than she cares to recall, while Kemo Sabe pondered on the events and doings of the day’s work, he dived maniacally into the flooded pools, releasing the methane gases which lurked under the rotting vegetation, and then emerged filthy and dripping, a horizontal line of peaty black showing how deep he had gone. One day, dashing at the gallop past some picnickers, he stole a ham sandwich out of a child’s outstretched hand without missing a beat; amazingly, there was mirth everywhere – only Noggsy could have got away with that! Over his thirteen years, he moved from city to countryside to town, adapting with insoucience both to the change of terrain and, in time, the arrival of Uncle Willie from the Black Country, when he was four. The look on his face when, on collecting young Willie, Kemo Sabe put him in the car is still vivid: ‘What have you got him for?’ Apart from expressing that misgiving, he gave way to little Willie on everything and together they flourished and grew old. Newman came from a very distinguished line of Golden Retrievers, the Nortonwoods of Old Damson Lane, in the then-leafy part of Solihull, south of Birmingham, and getting him was the most amazing stroke of good fortune, the kind that does sometimes in fact happen to the blissfully ignorant. 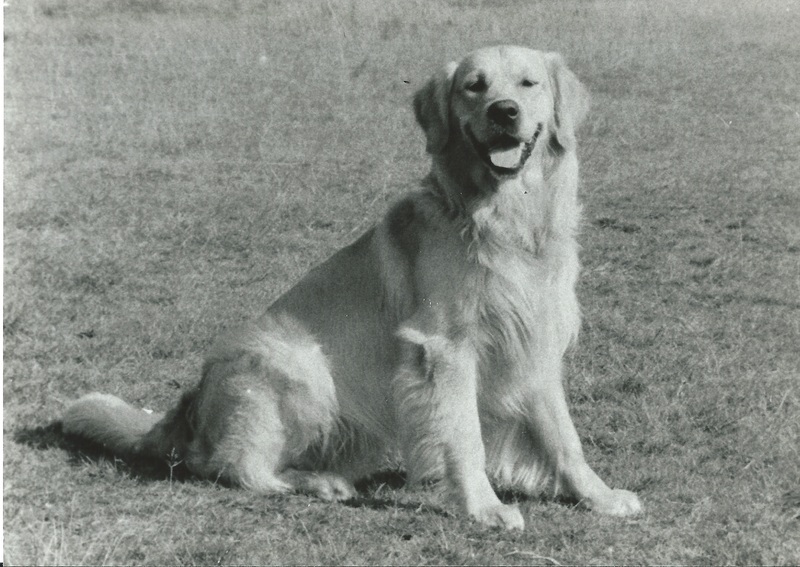 Of impeccable pedigree, and from a long-line of champions including the lustrous Nortonwood Faunus and Camrose Cabus Christopher, he would never have been available had not the family which reserved him at three weeks decided that, once he’d grown up, a big Golden Retriever would be a bit too big for them. So it happened that the gods smiled and, one wet Friday in March, an on-the-off-chance phone call to a breeder whose name meant nothing but was suggested by a vet the other side of Birmingham resulted in the handing over (on payment of what now seems a derisory sum!) of a perfect eight-week-old pup, and the beginning of a long love story. That first weekend, when she held the dozing, dreaming Noggsy in her arms, Kemo Sabe was overwhelmed by a happiness hitherto unknown. Brave, strong, gentle and with a strong sense of humour as well as the ability to smile and indeed play jokes, Noggsy could also pout and look morose: words were unnecessary to one so physically eloquent and whose emotional intelligence was so great. In his last few weeks of life, when it became obvious that he would soon have to be put to sleep, he made a progress to visit his most devoted fans, who held him to them for the final time. His death, when it came one frozen January day, when earth lay hard as iron about the grave whose digging he had supervised, dealt a real and terrible blow. Only Uncle Johnny has come near to filling his shoes, the Prince among dogs who was the original Newman Noggs.